Every bride and groom spend months of planning and preparation for their wedding day. After the ceremony has ended, the bridal dress is packed away and hardly ever seen again. 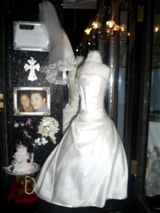 Modisteria will re-create the bridal gown into a miniaturized version and place it into a 21 inch high, mahogony curio cabinet that can be tastefully displayed or hung on a wall to enjoy for years to come. The end product created is truly an heirloom quality keepsake. We also include a miniaturized framed photo from your wedding as well as a miniature version of your actual invitation. Other items such as the headpiece, bouquet, shoes, purse, cake, etc... can be added, upon your request, to help complete the total ensemble. 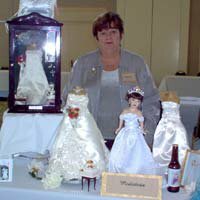 Modisteria can also create for the bride a miniature version 18-20 inches tall - of the bride's designer couture wedding gown. Fashionably displayed on a 21-inch miniature dressmaker form, very classic. Ideal for those on a budget! Great for the mother of the bride to give her daughter, or for a grandmother, aunt, or bridal attendants gift to the bride. Ask for details. "We create as close as possible to the original designer gown."